Well fed and overly caffeinated, we hit the road again with hopes of reaching the ‘ville before midnight. This portion of the drive is always a bit difficult due to the nature of the roads. While they are very well maintained, there are only pockets of lighted spots. Once the sun goes down, you have to rely on the reflective paint and hard road reflectors to guide you. There are many long stretches of road which have little to no traffic, which while very easy to drive on, it makes it hard to keep your focus. After about five (5) hours of driving, we noticed a little green sign off of I-10 … Publix! 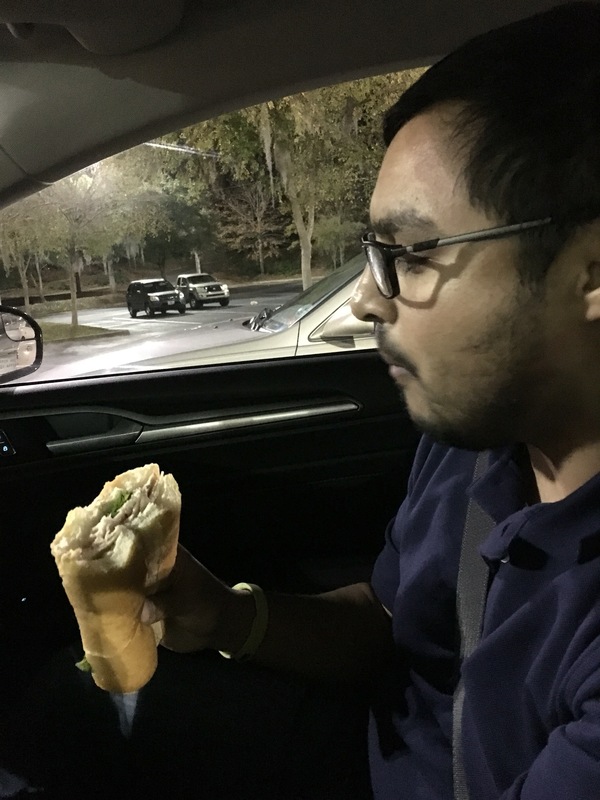 If you’ve never had a Publix sub, you’ve never truly lived. Sadly, I had to resort to a salad due to the whole “can’t eat bread thing,” but my husband certainly indulged. Just something about that freshly baked bread that hits all your senses.